My obsession of researching baby products finally met it’s match when it came to choosing my cloth diapering system. I will admit, I am extremely particular to the point were Lucas thinks says that I am borderline OCD. My biggest thing is that things HAVE to match and if they can all be the same size or by the same brand, that’s how I like it. If I can match anything, especially with Ke’alohi’s things, I try to. We have all the same brand and size bottles, towels, blankets, bibs, and when we bought her toys in the beginning, I even trying to buy only one brand of toys. So when I researched cloth diapers, I wanted to have all of one type of diaper and it had to be a one size pocket diaper. I first tried bumGenious 4.0 pocket diapers and while I liked them, they were too bulky for me and I wasn’t a huge fan of the snap rise on the front of the diaper. The second diaper I tried, that I really should have tried from the beginning, was the One Size Elite Fuzzibunz diapers. I got interested in cloth diapering because of this diaper and I’m not really sure why I didn’t start with this diaper. Let’s start with what I love about the diaper; how adjustable it is! Fuzzibunz uses a unique way of sizing the diapers to fit from newborns until potty training with adjustable elastic in the wait and legs that stays hidden and out of the way! Yes, it takes a little time to adjust each diaper when you first get the diapers and when your baby moves up a size, but once you take the two minutes per diaper to adjust the size you never have to do it again for months! Each diaper comes with two inserts and extra elastic so these diapers really last a while. 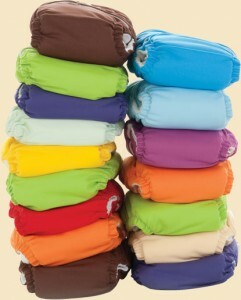 The outer shell of the diaper is a soft, waterproof PUL fabric that keeps your baby and their clothes dry. The inside fabric is a fleece layer that wicks moisture away from your baby’s bum. What I love about this is that the pee doesn’t stay in contact with your baby, reducing chances of your baby getting any diaper rash. 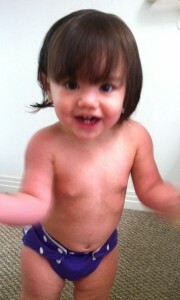 Since switching to cloth diapers a couple months ago, we haven’t had any cases of diaper rash. The last component that makes up the diaper is the minky inserts, what absorbs the pee. You get a newborn size insert and a medium/large insert with each diaper. We double up and use them both at night for added absorbency. If the diaper wasn’t reason to love Fuzzibunz, then their customer service is what will win you over. I have never experienced as good service with any company ever as I did with Fuzzibunz. A couple weeks into cloth diapering, I had a few questions about washing and soaking my diapers and Lindsay, completely went above and beyond for me when she was answering my questions. They actually hire other moms that use Fuzzibunz in Customer Service so that they can really help you when troubleshooting any issues that may arise. These diapers really are the best cloth diapering system for us and we are so happy with them! I am the same way, I like matching everything whenever possible. And I’m currently trying to decide what cloth diapers for our little one on the way, so thanks for the review! !